This is going to be a very brief post thanks to two things: my holiday and Eurovision. There isn't really room for anything else in May, so I haven't watched too much this month. It would not be this time of year without my favourite quiz show, and the good news is that "THE NATIONAL LOTTERY - WHO DARES WINS" is back on a Saturday night on BBC1, therefore all is right with the world and after all, I need something to help me get over my PED (Post-Eurovision Depression, to the uninitiated). Talking of which...BBC4 at least took the time to commemorate a big anniversary, but mainly focused on the United Kingdom's ups and downs in the contest. In "EUROVISION AT 60" we had all the ingredients you would expect, including observations from among others Terry Wogan, Bucks Fizz, Katrina and good old Paul 'Dr Eurovision' Jordan. It was an interesting enough documentary although being the BBC it fell back on the old reliable clips at the expense of a narrative waiting to be told about how the contest has spectacularly evolved over recent years. Despite its very contemporary setting in the world of the hip hop music business, there is something reassuringly familiar about "EMPIRE" (E4) which is rooted in the 80s golden age of soapy sagas like "Dallas" and "Dynasty". All the familiar traits are there and label head Lucious' ex-wife Cookie could have walked right out of those 80s soaps. It's lightweight but fun viewing and a good way to pass an hour. When I started my monthly TV reviews all those years ago, streaming hadn't been invented: you watched TV programmes on TV, and that was it. However even an old-school telly watcher like me has to move with the times, and I'm getting into streaming. After all, why have Amazon Prime (which I primarily have for online shopping deliveries) if you're not going to take up all the other advantages of this service? There's lots of TV and movies on Amazon Instant Video if you subscribe to Prime. Faithful travelling companion's got me into watching the rather good "NASHVILLE" which is currently in its 3rd series on More 4, so I've got a bit of catching up to do with the first and second series on Amazon Instant Video. 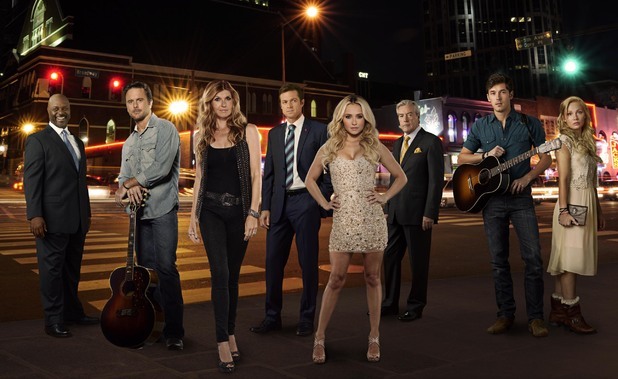 The show is, as the title suggests, set in the country music scene and is centred on the battle between country music's old and new stars Rayna and Juliette, the latter played by Hayden Panettiere who I will always remember as the cheerleader from "Heroes" (which was one of my favourite shows in the early days of this blog!) but she is in a very different role here. Going back to ITV now - must we really? - and as is the case every May, everything stops for Cowell. Even "CORONATION STREET", which over the last 4 years or so has had to fit in with the "Britain's Got Talent" live week schedule and bring even more drama than usual. This time last year we had Tina's murder; this year it was Steve and Michelle's wedding being quickly overshadowed by the Victoria Court fire. Yes that's the Victoria Court flats which we've hardly ever seen and, quite frankly, forgot about until the current story. At the time of writing, Kal (Leanne's boyfriend) has gone to the great soap opera in the sky, going out in a blaze of glory (literally!) dying a hero. I hate these drama-disasters, whether it's a fire or a tram crash or an explosion. And do you know how they always announce those helplines at the end of the show if there's been a tragic storyline? Well, I have an idea for another one: "If you have been affected by the bad acting in this show, please call.....!" Finally, I'd just like to mention a show which moved me so much that I cried all the way through it. "THE STRANGER ON THE BRIDGE" (Channel 4) told the story of Jonny Benjamin, a guy who had tried to attempt suicide on Waterloo Bridge and was talked out of it by a guy called 'Mike'. The programme focused on Jonny's attempt to find 'Mike' and was gripping from start to finish. 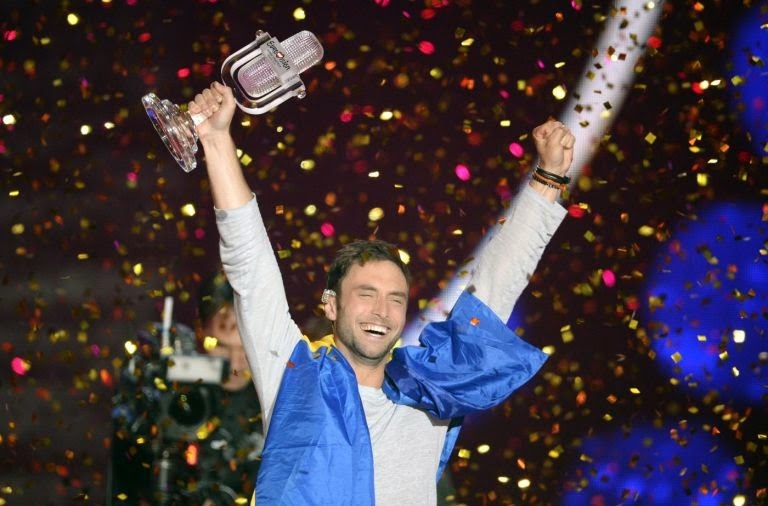 Måns Zelmerlöw won last night's Eurovision Song Contest with "Heroes", giving Sweden its 6th win overall and also their 2nd win out of the last 4 contests. In this 60th anniversary year, the Vienna contest appropriately became a record-breaker by being the longest ever - an epic and bum-numbingly 3 hours 59 minutes long. Over the next week I will be posting my reviews of both semi-finals and the grand final, but I just wanted to gather a few more immediate thoughts and post them here today. For those of us who have been Måns fans since his first Melfest performance in 2007, it was great to see him finally represent Sweden this year and go on to conquer Europe. Yet today, I have mixed feelings on what has turned out to be a hollow victory, as it emerged that Italy resoundingly won the televote, with Russia 2nd and Sweden only 3rd - yet Sweden won by virtue of a combined ranking system whereby the jury ranking can completely overrule the televote. I can understand why the juries were reintroduced to combat the rampant neighbour/bloc voting (which the UK media still loves to use as a stick to beat the contest with) but there is something which stinks with a system where viewers are invited to spend money to phone or text their vote, then it later emerges that our votes haven't really counted after all. The EBU has tried a number of voting strategies over the years but this one definitely needs a rethink. It may not quite be "the greatest anthem ever heard" but "Heroes" was the winner which the Eurovision Song Contest needed. Neither "Only Teardrops" nor "Rise Like A Phoenix" really translated from winners into international hits, and the last winner to do this came from, yes, Sweden of course. Although "Grande Amore" remains my true winner of this year, and the quality and power of this song and performance blew everyone and everything off the stage, I will be the first to acknowledge that it would not have been the best winner if we are looking at the commercial hit aspect of a Eurovision winning song. In terms of career success though, Il Volo are already established in various international markets worldwide and their ESC appearance will have given them a further boost in terms of tours and album sales. So we can say that although Il Volo maybe didn't win the battle, in the longer term they might just win the war. "Heroes" may be a little too derivative of recent dance hits, but it is a radio-friendly contemporary hit song (unless you live in the UK of course, where you'll never hear a Eurovision song on the radio) and will hopefully inspire more modern, uptempo songs next year to sweep away the ballad-heavy line-up of 2015. The other key issue here is how Måns can use his win to launch an international career. He has an album ready to go, "Perfectly Damaged" which should maintain the ESC winning momentum - something which both Loreen and Conchita Wurst failed to capitalise on. For genuine innovation this year, look no further than Belgium's Loic Nottet, who got everything right - a quirky, unusual song which is a million miles away from a 'Eurovision song', with very original staging, which was rewarded with 4th place. Commercially, post-contest, "Rhythm Inside" looks like becoming this year's "Calm After The Storm" and deservedly so. Likewise, I am glad that Russia did not win: not because of the artist, or the song, but for reasons completely unrelated to a song contest. And I'll leave it there. And as sure as night follows day, the United Kingdom ended up way down the right hand side of the scoreboard, 24th out of 27. But let's look on the bright side - we didn't get the dreaded nil points! Germany and Austria shared that 'honour' this year. Sweden won last night with a contemporary, well-staged song sung by an experienced singer and performer. The UK sent two unknown, inexperienced singers with a song which, although certainly unusual and different, could never have any life outside of the contest. I don't want to see Electro Velvet scapegoated for this year's failure: I sincerely hope they enjoyed their Eurovision experience. Participating in the Eurovision Song Contest is an absolute honour, guaranteeing a massive worldwide television audience and eternal fame/notoriety within the ESC fan bubble! As ever, the fault initially lies with the BBC but the UK's annual Eurovision failure is more deep-rooted than that. Today I've been reading various UK media articles about last night's show, and I'm wondering if they watched the same show which I did. Ridiculing the Eurovision Song Contest seems to be a national sport over here, and the quality of singers, songs and performances is always overlooked in favour of a sarcastic, dismissive, dated and out of touch view of the contest. That is also symptomatic of this country's attitude to Europe as a whole. It's that arrogance, that superiority, that 'let's all laugh at the funny foreigners', the terrible attitude to migrant workers which has driven the anti-EU agenda, need I go on? And then they wonder why we don't do well at Eurovision? There is a new generation of Eurovision fans here in the UK, driving the contest's popularity upwards and onwards through social media. What is now needed is for a more positive approach to the contest from within mainstream media, press, radio, television, to drive away the cynicism and send out a more positive message about the Eurovision Song Contest, which in time may translate into a more positive view of Europe as a whole. But as the UK has just elected a government (not in my name) which is racing towards an in/out EU referendum, I won't hold my breath. I want to end on a positive note though: the Eurovision Song Contest has always been special to me, but these days it's even more special thanks to sharing the experience with other fans/obsessives who have become my friends through our shared love of this wonderful event. Thanks to all of you for making it so wonderful! EDIT 30.05.15: I'd hoped to publish my ESC semi-final and final reviews by now, but the best laid plans etc etc....anyway they should appear within the next couple of weeks, all being well. Many refer to the Eurovision Song Contest as "gay Christmas". However as a 'straight' fan I'd like to go a little bit further and compare Eurovision and Christmas. Both are big annual much-anticipated events. Both are loved and hated. But in Harry Hill style, which is better? When I woke up this morning with a feeling of uncontrollable excitement, one thought came into my mind. "This is how you should feel at Christmas, instead of feeling completely drained and exhausted by the weeks which have gone before it". Excited, buzzing, happy. Remember that feeling? That, my friends, is the Eurovision feeling. You never forget Eurovision. I mean admit it folks, how many of you really remember what presents you give or receive every Christmas? For Eurovision fans we will always remember the smallest or biggest details, even many years down the line. Despite the view of Eurovision haters that you forget the songs almost immediately, we fans know differently - Eurovision (and national final) songs and performances will stay with us for a long long time. Eurovision is cheaper than Christmas, and arguably better value for money. Speaking for the stay-at-home fan here, there is very minimal financial outlay apart from the CDs/DVDs etc. (Unless of course you are a completist collector of auctioned press packs etc). You don't have to save up all year or worry about what to buy for everyone. You don't have to worry about the next credit card bill. Eurovision is better television. Christmas telly is .....ugh. Seasonal specials and soaps with people trying to show an unrealistic portrayal of a Christmas which doesn't really exist. Eurovision, on the other hand, is a top-class three night televisual extravaganza and is a billion times better than the so-called "event TV" of X Factor which marks the lead-up to Christmas. Eurovision is on at a better time of year. Let's face it, December is dark and cold and dismal. Whereas even if the weather isn't too great in May, at least we have lots of long light nights and overall it's just a much better time of year. Eurovision has better music and it differs from year to year. Contrary to the British media's view that the contest is just full of bad music, we fans know better. There's lots of little gems to be found in the national finals process and once we get to the contest there will always be a few songs to love. At Christmas, on the other hand, we have the same songs foisted on us year after year after year, against our will, for what seems like months and months on end! At least we choose to listen to Eurovision songs! Eurovision brings people together. There is too much fake/forced jollity around at Christmas. People feel they need to pretend to enjoy the occasion when in fact they'd rather be anywhere else. Eurovision fans may not all like the same songs, but we are all united in our love of the Eurovision Song Contest, and the social media aspect has brought us all together. Eurovision is for life and not just for.... OK that's enough. Gotta go, three hours to go, bye bye!! Eurovision Semi-Final 2 Predictions: 9 out of 10!! So a few words about tonight (or technically last night I guess, as it's now after midnight). Due to a prior engagement I was unable to watch the 2nd ESC semi final live, however I made sure that I watched it spoiler-free and have just finished watching it - by the way, what a drastic cut-off BBC Three, marks deducted - tut tut! So semi-final 1 is over, and I got 7 out of my 10 predictions right. 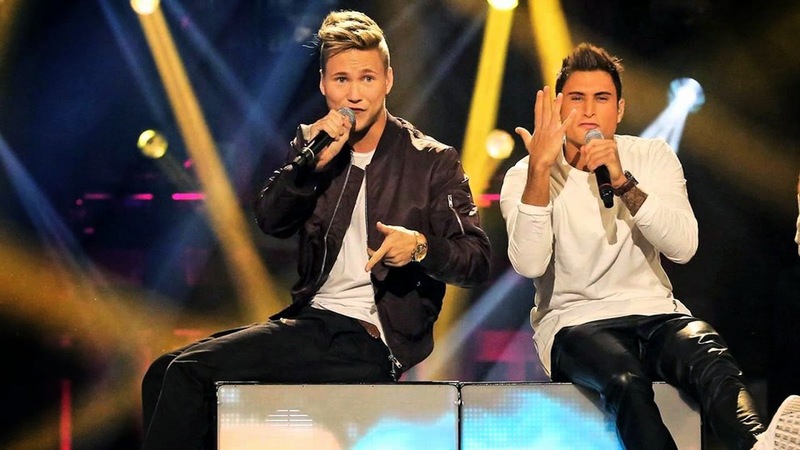 Very very disappointed that neither FYR Macedonia's Daniel nor Denmark's Anti Social Media will be joining the Saturday night final party, but with some consolation that Serbia and Belgium have made it after being rewarded for above-average performances. I'm still surprised that Hungary's snooze-fest (which we were so impressed by that we talked all through it, as you will learn in my soon to follow blog post!) made it but there you go. Russia's entry has suddenly become a very dangerous contender, whilst their neighbours Finland proved that it takes more than the 'sympathy vote' to reach the final. I've written about 7 different versions of my prediction list, as it is really a tough one to call. But with just under 2 hours to go here is my final list of who I think will qualify to Saturday night's final. As usual, if I get more than 50% of these right I will be very happy. Remember this is who I think will qualify, not who I want to: in the case of Belgium and to a lesser extent Belarus, I hope I'm wrong. Apart from the big 5 and the defending champions, Austria, we have another country and a very special guest in this year's final - Australia, who have been invited as a one-off special guest to this year's 60th contest. There was some opposition to Australia's participation in this year's ESC from some sections of the fan community, but after the initial shock, I was very agreeable to the idea. After all, Australia has a very committed and loyal Eurovision fan community, and as associate EBU members they do have a right to be there after all! And they might even have a serious chance of winning the thing! AUSTRALIA- "Tonight Again" - Guy Sebastian. Lots of names were being thrown around before the official launch. I remember tuning in for the live announcement that Guy Sebastian would represent Australia at this year's ESC, and I was very happy with this. Guy is a familiar name to those of us who followed all the international 'Idol' contests in their early days before we became saturated with TV talent shows. Anyway he's a safe pair of hands (or lungs) and "Tonight Again" is an extremely catchy pop song, with an incredibly good chance of winning, particularly if the juries and voters embrace the novelty value of Australia's participation. Either that or it could spectacularly backfire, but I'm convinced it's going to do very well. AUSTRIA - "I Am Yours" - The Makemakes. After being chosen as this year's French representative, Lisa was apparently targeted in some sections of the French media for not being young enough, thin enough or pretty enough, which is a bit ridiculous. "N'Oubliez Pas"is written by Robert Goldman, the brother of the great Jean-Jacques Goldman. On first hearing I was struck by its similarity in tone to Isabelle Boulay's excellent "Parle-Moi" and then I discovered that Robert Goldman also wrote that, under his pseudonym of Jimmy Kapler he had written some of the biggest French hits since 2000 and of course was also responsible for Natasha St-Pier's ESC entry so he's got some previous Eurovision history too. This song is a subtle and classy ballad, but it's just too forgettable and gets a bit too shouty towards the end. GERMANY - "Black Smoke" - Ann Sophie. The German final was a complete headline-grabber. you had The Voice winner Andreas Kummert with his bluesy stomper "Heart of Stone". People voted for it in droves, but then he turned his back on the German public. It was all too much for him. There was booing. And Ann Sophie then inherited the right to represent Germany in Vienna. This song has been co-written by UK chart star Ella Eyre, which makes me wonder why UK artists are having to put songs into various countries' national finals whilst being overlooked by our own country's selection process....oh I could go on and on. But back to Ann Sophie. She looks like Lena's older sister but won't do as well as she did; she will do better than Elaiza though! It's a contemporary song and I just hope they improve her styling from the national final too. This is a strange song as sometimes I like it, sometimes I don't. ITALY - "Grande Amore" - Il Volo. I had my first full Sanremo online experience this year and I completely enjoyed it! Of course the contest had a very different dimension for me: "Fatti Avanti Amore" by Nek was my favourite song but I was sensible enough to know that he probably wouldn't go to ESC if he won. In the end that was all irrelevant as it was "Grande Amore" which triumphed. The three young men who make up Il Volo are already an established act, and this song has a massive view count on YouTube. Everything is pointing to a win or at least top 3 for this one, thanks to the combination of the trio's powerful vocals and a song which is packed with drama and emotion, and which crosses the linguistic barrier. In a year of forgettable ballads and mid-tempo songs, this has the strength and quality to go all the way. SPAIN - "Amanecer" - Edurne. Year after year, Spain completely waste their opportunities at Eurovision. I know she has a lot of fans but this song does nothing for me, despite being another G;son/Sanchez-Ohlsson rewrite. They were also responsible for D'Nash and Pastora Soler's songs but this doesn't even come close. It's all style over substance and it fails to move me. In the time-honoured fashion of the old Eurovision Song Contest preview shows, we've left the UK entry until last. UNITED KINGDOM - "Still In Love With You" - Electro Velvet. It's not any one of about 300 suggested UK entrants this year. As I said in a Twitter post at the time the song was revealed, it sounds like the UK entry for the 1929 ESC, if such a thing had existed then. To judge this song, you have to divorce it from what is current in the UK, and just accept it as a completely daft, fun, throwaway song. And that's what it is. But Eurovision is a different animal these days. By the way, I'm guessing that after that horrible Tory win in last week's elections (and promised EU referendum) there won't be any repeat of the UK's post-election win of 1997. I think the main problem with this song is that despite it being a love song of sorts, Alex and Bianca do not play a convincing couple and there appears to be a lack of chemistry between them when performing this duet. I sincerely hope though that they have a ball in Vienna and enjoy their Eurovision experience, even if it will presumably end up propping up the right hand side of the scoreboard. Semi-Final 2 is usually always the 'better one' and this year it contains at least a couple of major contenders. On with the show! Remember these are my thoughts on the national final performances and recorded versions of the songs, and will probably be subject to change after seeing the rehearsals. 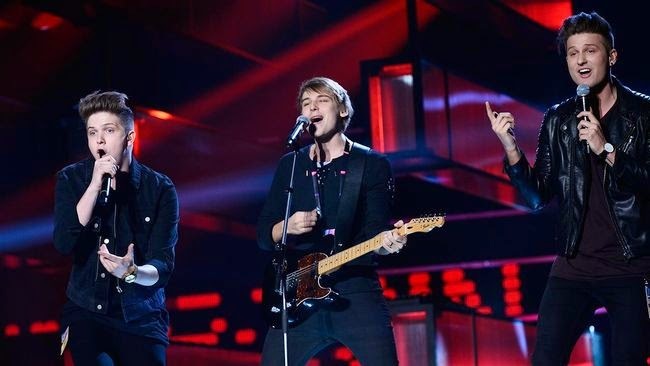 LITHUANIA - "This Time" - Monika Linkyte and Vaidas Baumila. They are an appealing couple and the national final performance was exuberant, enjoyable and - crucially in a very 'serious' year - fun. Vaidas is probably this year's Ott Lepland, loved by all, no matter your preference. There is a gleefully amateurish feel to this, and its success will probably depend on whether Europe is feeling their chemistry or not. The "one kiss!" - MWAH!! - part is a bit daft, but viewers remember a daft gimmick. It's cheerful country-flavoured pop and deserves a place in the final. IRELAND - "Playing With Numbers" - Molly Sterling. SAN MARINO - "Chain of Lights" - Michele Perniola and Anita Simoncini. 2015 is a very strange year. There's something missing for San Marino ...a certain Valentina Monetta no less. For she has finally stepped aside to make way for a new generation. We've got Michele, who previously represented San Marino in JESC and we've got Anita who, er, did the same last year as a member of the Peppermints with "Breaking My Heart" which I always had a soft spot for and still do. This on the other hand is ANOTHER. RALPH. SIEGEL. SONG. So we have two potentially exciting young performers weighed down by dated light-a-candle gubbins which I just know my mum will completely go into meltdown mode on hearing. It should have been called "Chain of S****". I really do not want to hear this again, OK? MONTENEGRO - "Adio" - Knez. It took me a long time before I started appreciating the ex-Yu entries at Eurovision. I was never a fan of the Zeljko ballads to begin with but "Nije Ljubav Stvar" won me over. I'm not sure if there is much mileage left in this franchise, but in the meantime we have "Adio" which is a very nice native language ballad well sung by Knez, who I'm sure will deliver a very solid performance in Vienna. As long as they avoid all the background skater nonsense of course. I'm sure there will be backing musicians with traditional instruments who will probably play a big part on stage - we expect nothing else from a Zeljko-written song. MALTA - "Warrior" - Amber. Yep another warrior. I have a problem with both of these warrior songs this year, as both of them fall short of the quality I would demand from Malta and/or Georgia. The success of this for me will depend on the screechiness level of the "breaaaak! through the silence" and how this line is delivered by Amber. As a song I probably prefer this to its Georgian namesake, but that's not saying much. This is still a disappointment. Come back Gianluca, or Firelight. One deliciously appealing thing about Norway at Eurovision in recent years has been the uncompromising darkness of their entries - from Margaret Berger to Carl Espen and now to "...Monster" which smashes the 'Eurovision song' stereotype to pieces. Yet I remain a little uncertain about the success of this song, and again it will all depend on a) how the song is staged and b) the reliability of Debrah's vocals. Nevertheless it is the kind of song which non-fans (and many even some fans, who knows?) would describe as 'too good for Eurovision', and lyrics which leave us wanting to know more of their story. Just what terrible thing did Mørland do in his early youth? Represent Norway at Junior Eurovision? PORTUGAL - "Há um Mar que nos Separa" - Leonor Andrade. She is a very pretty girl, and her national final appearance - Cheryl Fernandez-Versini in transition to glum angry goth - was in stark contrast to the rather bland song which she had to sing. This will probably be fighting off San Marino for bottom place on this year's overall standings. At least last year's song was lively, and catchy, and had the flippin' Suzy shake, and despite all that it still couldn't qualify. If that can't, this will never qualify in a million years. CZECH REPUBLIC - "Hope Never Dies" -Marta Jandová and Václav Noid Bárta. Welcome back CZ to ESC after all these years. Unfortunately this song is one from this year which has passed me by and I haven't listened to it as much as some of the other entries. They'll be hoping to deliver strong vocal performances which may pick up points from the juries but I can't see this getting out of this semi-final. ISRAEL - "Golden Boy" - Nadav Guedj. Haters, as they say, gonna hate. But this for me is this year's "Opa"/"Cheesecake" - daft, funny and catchy as hell. I don't believe in the concept of 'guilty pleasures' - there is no pleasure to be guilty of - but if such a thing existed in my life then "Golden Boy" would be the guiltiest of guilty pleasures. I'm not sure if first-time listeners would be able to cope with the multiple switches within this song - from pleading ballad to Timberlake funk and onto a more traditional ethnopop chorus. Nadav is only 16, which I find very hard to believe (!) but this song is great fun, you can't help smiling at the "but before I leave, let me show you Tel Aviv" line whilst the end of the song - "ok, we gotta go, three minutes, bye bye" is probably the best tribute to Eurovision's three minute rule, like, ever. LATVIA - "Love Injected" - Aminata. AZERBAIJAN - "Hour of the Wolf" - Elnur Huseynov. Yes, that's Elnur the 'angel' from the Azeri debut entry in 2008. Since that time he's gone on to win The Voice of Turkey, And his voice is outstanding on this huge bought-in Swedish ballad and it's a testament to his vocal quality that he turns a not-great song into a serious contender. The trouble with Azerbaijan is that the allegations which have dogged their every move at Eurovision for the past couple of years will continue to cast a shadow over their participation and we will forever wonder just what is going on. It will be interesting to see how this does after last year's shock failure (of a song which didn't deserve to do well anyway). ICELAND - "Unbroken" - Maria Olafs. No Iceland, no, don't do this to me after all these years of high quality entries and great artists. Now it's a barefoot manic pixie "tonight Matthew I'm gonna be Emmelie de Forest" clone. This sounds like a Disney movie song (I just wonder if they'll tap into that Frozen-type demographic?) or a song from a Dawson's Creek-type teen drama. My main problem with this, apart from "Feathers" not winning the national final, is that this song is just far too bland and doesn't move me. At all. It does have a good draw position so should be ok to qualify and then end up about 15th in the final. SWEDEN - "Heroes" - Måns Zelmerlöw. 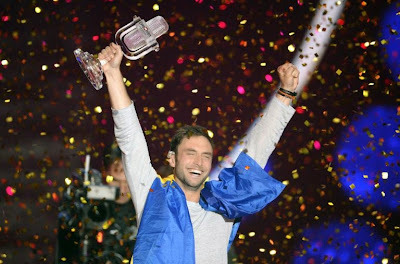 I've followed Måns' progress in Melodifestivalen over the years, so was very happy to finally see him win it. The visual presentation of the song was quite spectacular, until we found out that the idea wasn't as original as first thought. Some could maybe say the same about the David Guetta-influenced song as well. Yet it's one of the few songs which had the complete sound and vision package by the time of the national final, which made it one of the advance favourites. So this is a total cert to qualify, although the song in danger of being completely overshadowed and upstaged by whatever form those little stick men are gonna take. SWITZERLAND - "Time To Shine" - Melanie Rene. I watched the Swiss national final and can't really remember much about it apart from the hot guy presenting it. I haven't played this very much, it's ok but just ok. In the same bracket as those warrior-y mid-tempo songs which all become interchangeable after a while. The semi-final may be her time to shine but I can't see her making the final. CYPRUS - "One Thing I Should Have Done" - John Karayiannis. I caught a little bit of the Cyprus national final and immediately had that 'this is going to do well at Eurovision' moment. It's this year's less-is-more, touching ballad and when he sings "I should've been there for you!" then you have a heart of stone if you're not feeling that. OK so it's, em, 'influenced' by Extreme's "More Than Words" but it wouldn't be the first ESC entry which sounded like another song. This will do well because he will make that all-important connection with the viewers. SLOVENIA - "Here For You" - Maraaya. I got the Eurovision-contender chills when I heard this in the Slovenian final. It's a song with instant appeal, once you get past the weirdness of the headphones and the 'air violinist' - my main problem at this time is wondering just how their presentation of this song is going to translate from that little Slovenian TV studio at the national final, to the big stage in Vienna. Slovenia doesn't traditionally have too many friends at ESC but I think this is going to get their best result in years. At least top 10. POLAND - "In The Name of Love" - Monika Kuszynska. Something a bit more traditional this year from Poland and not a butter churner in sight. It's a pleasant enough ballad but doesn't really have that something particularly special. The song will attract attention thanks to the singer's disability and I wonder if that will be reflected in her onstage performance or not? It does have a great draw position, which combined with the good old diaspora vote, may just be enough to take it to the final. Going home - Ireland, San Marino, Malta, Portugal, Czech Republic, Latvia, Switzerland. Where has the time gone? It seems no time since national finals ended (well, no time since I got round to writing those blog posts anyway!). Rehearsals are imminent and it will soon be Eurovision week so time is running out for me to finally publish my thoughts on this year's songs. Let's have a listen to the songs from Semi-Final 1. MOLDOVA - "I Want Your Love" - Eduard Romanyuta. This year's contest opens with a Ukrainian singing a song with no Moldovan involvement whatsoever. It was a controversial winner in its own national final and there were lots and lots of allegations. My main gripe was that Eduard denied us the utter joy of the return of Epic Sax Guy to ESC. In a year of ballads and mid-tempos, this is one of the few up-tempo entries in this semi-final so I suppose that's how it ended up opening the contest. This song sounds about 15 years out of date and sounds like a Backstreet Boys album track. As for qualification chances, he would need to summon up some of his home country's ability to turn something average into something special. ARMENIA - "Face The Shadow" - Genealogy. "Doooooooon't deeeeeeeenyyyyyyyy!" Genealogy was a good idea in theory, putting together performers with Armenian origin from the five continents, along with Inga of Inga-and-Anush fame, but the song is just a messy screech-fest. This song was originally titled "Don't Deny" and there were lots of allusions to the centenary commemoration of the Armenian genocide. Then the HoD meeting took place, I assumed there was a finger-wagging and then and the song title magically transformed into "Face The Shadow" but the title is the only change. The draw of death - 2nd place in the running order - suggests that the EBU are still not too happy with this either. Neither am I really. I wanted something great, and this is not it. It's painful to listen to, not because of the subject matter, but purely because of the unlistenable shrieking. BELGIUM - "Rhythm Inside" - Loïc Nottet. Apart from its little nod to Lorde's "Royals" - a massive worldwide hit from a couple of years ago - this is one of the most unique and different entries in this year's contest, and whilst some have criticised his pronunciation of English, I think it's quite delicious. 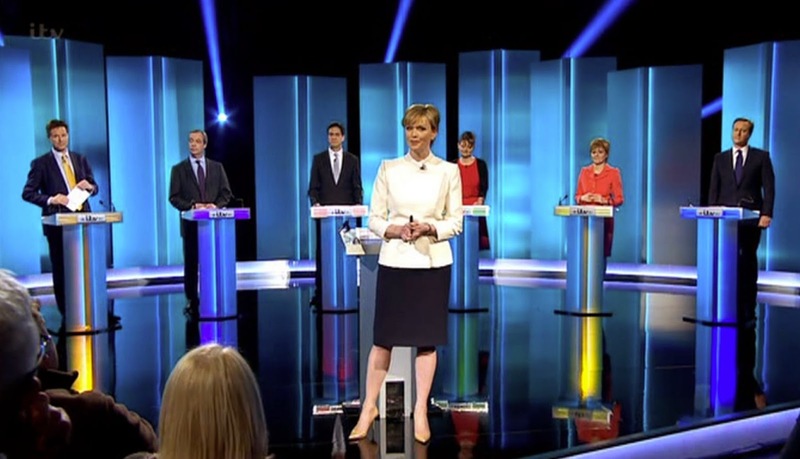 But will Europe's voters and juries go for this level of minimalism? And is Europe ready for rapapap? As time goes on I doubt it; the draw is also killing the song's choices. I would love to be wrong and see it qualify. Still, the future looks bright for him as he seems to be a promising young artist with a vision of a career beyond The Voice and ESC. NETHERLANDS - "Walk Along" - Trijntje Oosterhuis. FINLAND -"Aina mun pitää"- Pertti Kurikan Nimipäivät. My views on this song were initially coloured by the failure of Satin Circus' "Crossroads" to represent Finland this year - I still feel that song would have done very well indeed, and it remains one of my national final favourites this year despite its chances being scuppered by poor live performances. But enough of that song because I'm supposed to be talking about this one. And this is all about the back story of the band whose special needs haven't stopped them playing the punk music which they love. It's a heartwarming human story which is guaranteed to be a televote winner and I think this is therefore a guaranteed qualifier - they will also be a breath of fresh air among the ballads and the bland. However there is also the risk of it qualifying purely because of the sympathy vote? GREECE - "One Last Breath" - Maria Elena Kyriacou. Where has my beloved uptempo Greece gone? Even they've sent a bloody ballad this year for for goodness sake. But Maria Elena has a very good chance of qualifying - she's a vocal powerhouse here, and they've used the musical template of "Rise Like A Phoenix" probably more blatantly than any other entry this year. It doesn't really do anything for me but it's an absolute qualifier but in the battle of the big ballads, it will probably be buried by Russia in the final anyway. ESTONIA - "Goodbye to Yesterday" - Stig Rästa and Elina Born. This had massive momentum when it was chosen as the Estonian entry, I got the feeling that it faded as national finals season progressed but I'm hoping for a resurgence once the rehearsals start. GTY is often compared to the Common Linnets - it's a male/female duet but apart from that, I don't get the comparison. It is extremely cool, as befitting a song which made it out of the ultra-cool Eesti Laul, but is it too cool to the point of being ice-cold? The staging of this is going to be crucial: they need to bring a little more warmth to make Europe fall in love with them the way that we in the fandom have done. They just need to make sure that Europe 'gets' the subtlety of this song, the lyrics and the performance. Now there's a comparison with the Common Linnets we can hope for. FYR MACEDONIA - "Autumn Leaves" - Daniel Kajmakoski. SERBIA - "Beauty Never Lies" - Bojana Stamenov. A little flashback first: I enjoyed watching my first ever Serbian national final this year from beginning to end. I was initially cheering on my fave Serbian singer Aleksa Jelic with his vibrant dance-pop song "Vodi Me" but was hugely disappointed by the Melfest-style over-choreography of the song. And when Bojana took to the stage it was game over. "Ceo Svet Je Moje" had the drama, the dancers, the dress....and that mid-song transition from ballad to massive dance anthem. All good so far. And then they translated it into English. For me it really has lost a lot in translation, although it's doing that "I am beautiful no matter what they say" theme which will touch a lot of people. Me? I just wish it had stayed in Serbian. HUNGARY - "Wars for Nothing" - Boggie. As showbiz names go, Boggie is not a great showbiz name. And while the sentiment is good, this song is not. In recent years Hungary has brought so much to Eurovision particularly over the last 3 years and lest we forget the wonderful "Dance With Me" by Zoli Adok which I still love. Hungary has become one of the countries I look forward to seeing in Eurovision every year, along with Iceland they are top of my winner wish-list and ...then they go and spoil it all by sending something stupid like this snooze-fest. This song can just, um, Boggie off. BELARUS - "Time" - Uzari and Maimuna. Ah, memories. The Belarus final, along with the Albanian FiK epic, saved my Christmas so I will always be grateful to them for that. And when this song won I was quite happy about it for a strange reason. For this is not a great song, and it's far too repetitive, and it seems like some unfinished idea, as I'm still not convinced by the combination of Uzari's dance-pop and Maimuna giving it the full Vanessa-Mae. But all that aside, we have to ask the question, is time really like thunder? (Ah-haaaaaaa). Will this bring the thunder to Eurovision? Well....I still don't know. After the legend that was "Cheesecake" this is a very hard act to follow. RUSSIA - "A Million Voices" - Polina Gagarina. Going off on a tangent for a moment, the title of this song makes me think of the Harry Hill sketch with Stouffer the Cat singing "Seven Seconds" by Youssou N'Dour and Neneh Cherry. But getting myself off back off that tangent, this is a very traditional peace-themed ballad sung very well by a reasonably likeable singer. And it will probably get booed because it's Russia. But Russia still has a lot of friends at Eurovision, and I see this placing much higher than "What If" and "Shine". All I will say is that I wouldn't want it to win, for numerous reasons which I don't really want to go into here, or I will go on all night!! DENMARK - "The Way You Are" - Anti Social Media. Despite their name, Anti Social Media are the safe McFly wannabes whom it's ok to take home to mum. All these weeks on from the national final, I can't help but feel there's something missing here. It's very catchy and will stand out among the ballads and mid-tempos though, but it suffers from the curse of blandness which seems to have haunted some other Danish entries over the years (you know who you are....) and it doesn't really bring anything spectacular. But it fulfils that other Eurovision criteria as you do remember the chorus after one listen, so the job's done - but if it does qualify to the final, it will probably end mid-table. ALBANIA - "I'm Alive" - Elhaida Dani. I've already reviewed FiK in another post so will just summarised by saying that they missed a trick by not sending Lindita's song, but then events took a bizarre turn with the original winning song "Diell" replaced by "I'm Alive" ironically written by the same writers of "S'te Fal" (Zzap & Chriss) but missing the magic of that one for me. However Elhaida is definitely a safe pair of hands (lungs then!) for Albania and this song has become a massive fan favourite. ROMANIA - "De La Capat/All Over Again" - Voltaj. The original Romanian language version of this is just lovely, and the video narrative - of the children left behind whilst their parents move abroad to work - is so moving, and a welcome alternative take on the all too easy demonisation of migrant workers. Unfortunately the English version does not really convey this narrative as well as it could do. But it is one of the loveliest songs in this year's line-up, and it's a band, and I like bands, and I like this so will be very happy if it makes the final. It's my favourite Romanian entry since "Playing With Fire". GEORGIA - "Warrior" - Nina Sublatti. Typical Warriors. You don't get any for ages and then two of them come along at once, from Malta and Georgia. This one's a feisty Georgian take on Evanescence's Amy Lee. I have a problem with both of these Warriors in this year's ESC, as neither of them are really the finished article for me. In this instance Nina doesn't really have a conventional 'song' and it doesn't go anywhere for me if I'm honest. But she'll do enough to qualify I'm sure. Qualifying: Finland, Greece, Estonia, Serbia, FYR Macedonia, Russia, Albania, Denmark, Romania, Georgia. Going home: Moldova, Armenia, Belgium, Hungary, Belarus, Netherlands. So after four heats and one second chance contest, how did I feel about this year's Melodifestivalen? Disappointed. There were very few songs which had an immediate impact on me, and fewer which I would expect to listen to after the contest was over. 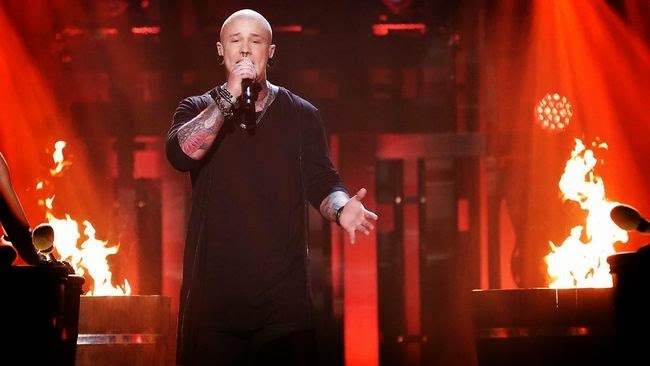 What the resurgence of Magnus Carlsson (going all the way to the final with "Möt mig i Gamla stan") also suggested to me was that the people of Sweden may have had enough of the attempts to modernise the contest and want to get back to the comfort of good old schlager. There was something for everything though, even if it wasn't always ideal. So....the last national finals evening of 2015, and a big decision. SVT or STV? 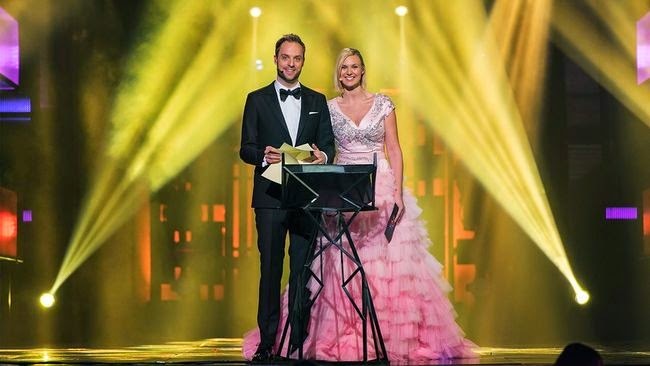 Melodifestivalen or Ant and Dec's Saturday Night Takeaway? Just joking of course....the real big decision was a scheduling nightmare, as SVT and NRK chose to put on the finals of Melodifestivalen and Melodi Grand Prix on the same evening. Having listened to the MGP finalists beforehand I decided that there wasn't enough there to keep me watching live, but I would catch-up later on. And despite 'abandoning' the live heats this year I still have some loyalty to Melodifestivalen. After a 'previously on' recap it was time for the first musical number of the evening. Which meant yet another national final appearance by the one and only Conchita Wurst along with Robin and Sanna singing The Final Countdown. (Christer Bjorkman was a substitute Conchita in the rehearsals!). And of course where would we be without a rendition of good old Rise Like A Phoenix. 1. "Groupie" - Samir and Viktor. L: They are not singers. Tabloid celebs, reality stuff type of thing. M: I guessed they weren't singers! Of course "Groupie" is not about groupies, but it's about group-selfies. This is very much "of its time" a bit like Nick Borgen's "World Wide Web" back in the day, so in years to come we'll look back with some amusement at how dated it all was. And then, to labour the on-trend point, they bring out a selfie stick. I despair. This has probably overstayed its welcome by 2½ minutes. But often when I say that about a song, those are the ones which eventually grow on me. And as if all that's not bad enough we now have the much maligned Filippa Bark. She's been "interviewing" the contestants over the weeks and received a lot of criticism from the Swedish press. I don't find her funny, although maybe that's because I'm not a native Swedish speaker, but I don't get that type of humour. 2. "Building It Up" - JTR. It's the "slot of doom" in the running order for the Aussie-Swedes. I don't really get the hate for this, but that's not to say I like it much either. It's generic 5SOS and 1D boyband pop, it sounds as if all their songs were put into a blender and came up with this. Apart from the catchy chorus hook line it's just....nothing. M: You should be giving it up. How true. L: Oh no...now there's a rap. This song is far too mundane and outstays its welcome. The staging is also too busy. Mum has now gone off to sleep. Sanna meanwhile has changed into a pink princess gown. Most of the internet doesn't like this dress, comparing it in similar terms to Yohanna's blue 'toilet roll holder' effort. However I rather like this. I'm a sucker for frills. (and you can sing that to the tune of "Sucker for Love" by Pauline, Melfest 2010). Sanna also has new haircut especially for the final. 3. "Make Me (La La La)" - Dinah Nah. The winner in the Andra Chansen duel of death against Dolly Style. Again the draw doesn't do her any favours, but this is a dynamic dance-pop song with a vibrancy lacking in many of this year's entries. This song enjoys some fanatical support from some of the ESC community but mum has now woken up and only wants to talk about Dinah's pink hair. 4. "Jag är fri (Manne Leam Frijje) -Jon Henrik Fjällgren. 5. "Can't Hurt Me Now" - Jessica Andersson. I tell mum that Jessica's a Melfest 'veteran' and has has had better songs in this. Its a country styled ballad. Jessica looks good, but the song doesn't do anything for either of us. And for all of us playing Melfest bingo you can tick off the wind machines. Mum is a lyrics person but again she's finding the lyrics of this pretty uninspiring. 6. "Heroes" - Måns Zelmerlöw. I'm not sure what SVT are trying to tell us by placing it 6th in the draw rather than the mythical pimp slot, although situated between two 'meh' entries perhaps makes it stand out even more. "Heroes" is of course an uptempo dance-pop song, many say that it's, ahem, 'inspired' by David Guetta's "Lovers On The Sun" (I actually prefer "Heroes" to that song though) but this is as much about the visual presentation. Despite a dynamic performance from Måns, the little stick man and his chums never fail to steal the show. As a potential Eurovision entry, this does have the complete package: good song, good performance, memorable visuals. 6. "Forever Starts Today" - Linus Svenning. Linus has finally listened and given us a change of clothes from that scabby old black tunic top (pictured above). He is now in a white t shirt.. This is a Kempe/Aleena Gibson song and if you're marking off the 'Avicii influenced' square on your Melfest bingo card then now's the time. Mum did actually remember this from last week. Fire and drums are so old hat though, they kind of remind me of the post-Ruslana years. It's not bad though, although probably also overstays its welcome. At least he looks a bit happier on this song, if only in the knowledge that he is probably guaranteed a guest spot on one or more of the Swedish summer TV shows. M: This isn't bad. Although I wish he would wear something different. 7. "Don't Stop" - Isa. In the weeks since this qualified for the final, this song seems to have grown in popularity with ESC fans and critics. The song certainly has bags of hit potential, and it's time to mark off the 'inspired by Taylor Swift's Shake It Off' square on your Melfest bingo card. I think we will definitely see her back here in a year or two. A youthful and energetic performance of a song which is just a little too generic for my tastes. Mum is not impressed with this one either. And then Filippa is back on. M: She's as funny as the toothache. L: Jon Henrik looks a bit pissed off with her. 8. "Mot Mig i Gamla Stan" - Magnus Carlsson. I'm enjoying this. 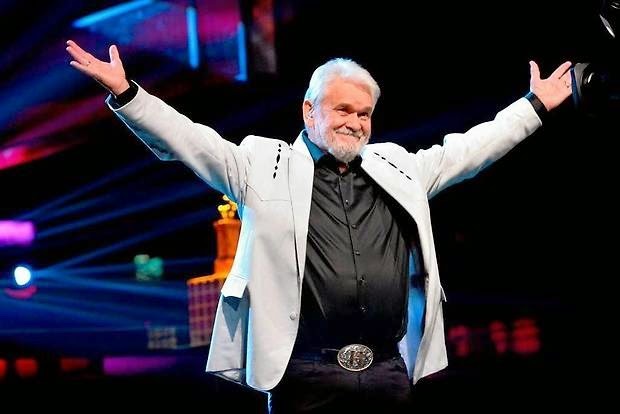 He's still got it, and he's bringing back schlager and happy memories of the 'old' Melfest days. I was so happy that he was rewarded with a place in the final. He totally deserved it. Key change yaaas. Very good. Mum's asleep again, so no comments on this one. 9. "Sting" - Eric Saade. Oh stiiiiink its gonna stink so bad was my first reaction to this song purely because it was one of the main contenders to win. He doesn't look a day older than when he was smashing through glass boxes in 2011, but his styling is very strange and doesn't do him any favours. The staging and effects are way ahead of many of the other entries but it's all style over substance. *EDIT: In the weeks after the contest, this song grew on me and now I play it quite a lot. Mum is asleep again so there are no comments. Although if she was awake she would probably say that he is a good-looking boy; I remember she was very keen on him when he previously appeared in Melodifestivalen. *EDIT: Whilst watching the "Inför Eurovision" shows this past couple of weeks on SVT, Mum commented that she thought Eric was good-looking, and I told her that a) I thought she'd say that, and b) I would mention this when I eventually got round to publishing this post. 10. "Don't Stop Believing" - Mariette. There's Rona Nishliu-esque hair. Wind machines. Floating drapes. And a 'Let it go, let it go'. Her performance is different class, if musically a little like Loreen on sleeping pills (!) and there is a key change. This is certainly a lot classier than some of this year's entries and does the business but my main concern is that this would probably get swamped in Vienna by other ballads and warrior princesses. But she is very good, it must be said, and I wouldn't bet against her coming back again. *EDIT: She's going to be reading out the Swedish results this year so she's definitely now well-integrated into the Melfest family! 12. "Guld Och Gröna Skogar" - Hasse Andersson. After Hasse made it out of Andra Chansen, Sweden was in the grip of Hassemania. And, finally, so was EuropeCrazy HQ. 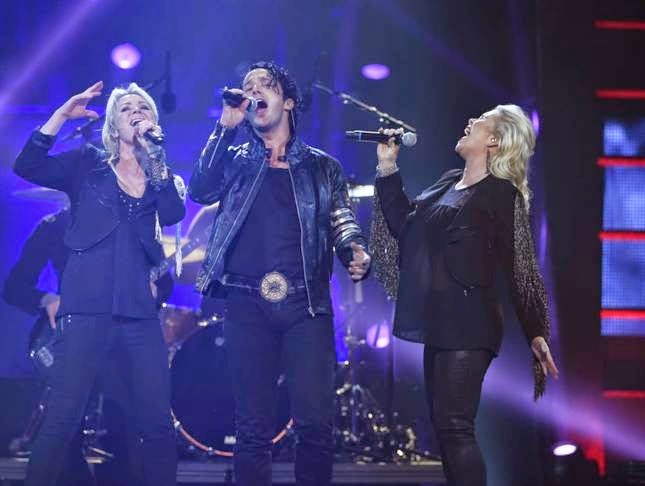 "Guld..." is so defiantly old-fashioned but crucially, his performance radiated pure enjoyment, something which often gets lost in Melodifestivalen artists' often ruthless and cynical race to the top. Time for the international jury vote. The traditional reworking of the previous year's winner can always be a bit hit or miss. Dirty Loops' version of "Undo" was a bit of both for me. A 1980s-Prince-style funky workout - with lasers!! - started well but, as is becoming a theme this evening - overstayed its welcome and became rather annoying. One last song from Sanna and Robin, who have done a rather good job of presenting this year's contest and have been a massive improvement on last year's disastrous duo. And now - big fanfare - the golden envelope, with the televote results. Which, in the time-honoured fashion, sees the voting percentages converted to points. Mariette is 4th, Eric 3rd, Hasse 2nd which means that Måns has won the televote....and the whole competition! So it's 3rd time lucky for Måns and he will now finally get the chance to represent Sweden at this year's Eurovision Song Contest in Vienna with "Heroes". I am very happy with this, because I think "Heroes" will give Sweden a better result than any of its other Melfest competitors this year. 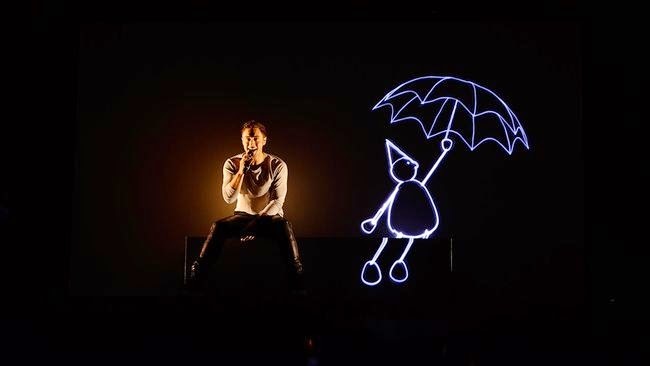 It has to be said though that the 'gimmick' - the little scene-stealing stick men projected alongside Måns on stage - will probably overshadow the song. It is very hard to divorce the song from the distinctive staging, even when you're listening to the audio version you automatically visualise that staging (well I do anyway) and so it will either be raining 12s or the song may be punished by the juries for its over-reliance on the visuals. It won't be long now until we find out! *EDIT* Since this post was written, there has been a plagiarism scandal, as the little stick man from "Heroes" was found to be, um, 'inspired' by a similar figure in a video by French performance artist A DandyPunk. So it's back to the drawing board for a new figure to replace him. I wonder if it will affect the end result??? Travel shows. There used to be lots of them on TV, from 'Holiday' to 'Wish You Were Here'. I've never seen Richard Ayoade before but my research tells me that he's been in loads of stuff on the telly, including something called "Gadget Man" so someone had an idea to send him off to various European cities, (accompanied by a different travelling companion every week) and call it "TRAVEL MAN" (Channel 4). This is being favourably compared to the unforgettable "An Idiot Abroad" and that's a pretty good comparison. Mr Ayoade is that rarity on TV these days - an intelligent and funny presenter - and is a refreshing change from all the so-called 'celebs' cluttering up our screens. This one, I think, can run and run: please take a note, Channel 4 - give us more of this and less of the sensationalist gutter-level so-called 'documentaries'. Which brings me to...well, there is an intelligent, thought-provoking documentary to be made about the travelling community, but while we wait for that, "MY BIG FAT GYPSY GRAND NATIONAL" (Channel 4) combined the topicality of Grand National week with, appropriately, flogging yet another dead horse in this franchise which is now well past its sell-by date. Back to travel, and another travel-themed series which caught my eye in March and April was "ELAINE C SMITH'S BURDZ EYE VIEW" (STV) which followed the popular Scottish comedienne/actress on tour in various locations including Oban, Rothesay and North Berwick, whilst getting a flavour of the various Scottish locations which she visited. My main problem with the series was that the episodes were just too short (in the Monday night 8pm 'This Is Scotland' slot on STV) and a longer programme could maybe have done the locations more justice. "CORONATION STREET" (ITV) - perma-scowl Faye's 'unexpected' pregnancy leading to Owen's departure; Sarah (-Lou) Platt's return from Italy with her bitchy doppelganger daughter Bethany; David and comedy gangster Callum's feud.....it's less like Corrie and more like Hollyoaks these days as there seems to be too much emphasis on the younger characters. However it looks as if Roy might finally be getting a new story, which is good, as he continues to act everyone off the screen. 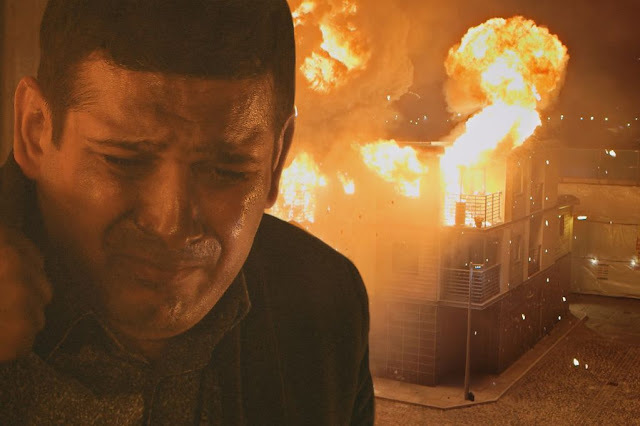 Corrie continues its downward slide on a very slippery slope, and news of yet another fire/explosion at the centre of the traditional 'Britain's Got Talent week' just makes my heart sink. The dumbing-down of TV documentaries depresses me. However even these days there are still some documentaries with the power to shock, But who'd have thought we'd get such a thing from BBC3? 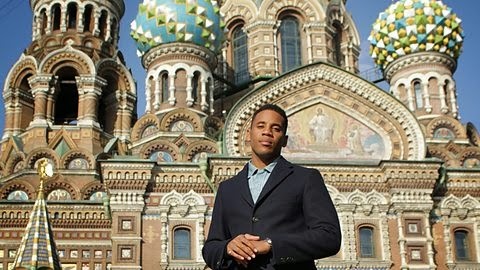 "REGGIE YATES' EXTREME RUSSIA" explored aspects of life in Putin's Russia. It was certainly a brave choice sending a black guy to meet nasty Nazi nationalists with a bizarre washing machine approach to multiculturalism - on learning of Yates' own mixed race ancestry, the response was "you can't wash white clothes with colours" and going on to describe mixed race people as "freaks". It was certainly one of the most awkward moments and I genuinely felt worried for Reggie's safety. "(Russia)....isn't used to people who look like me". I don't know who had this idea, but it was brave, crazy and ballsy. The nationalists were chilling, and 'knife fighting club' was shocking. The second documentary in the series looked at the oppression of gay people in Russia and was equally shocking. Finally, the third episode focused on a more frivolous topic - modelling - but it too had a dark side. A fascinating, thought-provoking but also upsetting documentary on BBC2 - "KILL THE CHRISTIANS" was about the threat to Christians living in the Middle East, as ISIS runs riot in that part of the world. You would need to have lived on Mars to have escaped all those horrible documentaries about immigrants/benefits/gypsies/all or some of the above. But free movement is a two way street, no matter what Farage and his cronies might say. And what if the 'immigrants' are British, and the locals are raising the same kind of issues cropping up in our own immigration 'debate'? "COSTA DEL SOL: LAST BRITS STANDING" (BBC1) profiled a group of various expats who went over to the Costa del Sol to make a new life....and then the recession hit. In the end, the bars closed, leaving the youngsters to come home and seek work, whilst the older residents searched for new ways to make a quick Euro - whether it was fish and chips or jive dance classes - with varying degrees of success. "30 DEGREES IN FEBRUARY" (Sky Arts) came to the end of its first series and I was genuinely sad to see it end. I didn't think I'd enjoy a series about the trials and tribulations of Swedes in Thailand, but it became must-see viewing. This was an incredibly engaging series which made me care about the characters, culminating in a very moving final couple of episodes. I did a bit of research and found out that a second series is finally in production. Fingers crossed it eventually makes it over here so that we get to find out what happened next to the characters who made series 1 so special, including Oh and Glenn (pictured above). 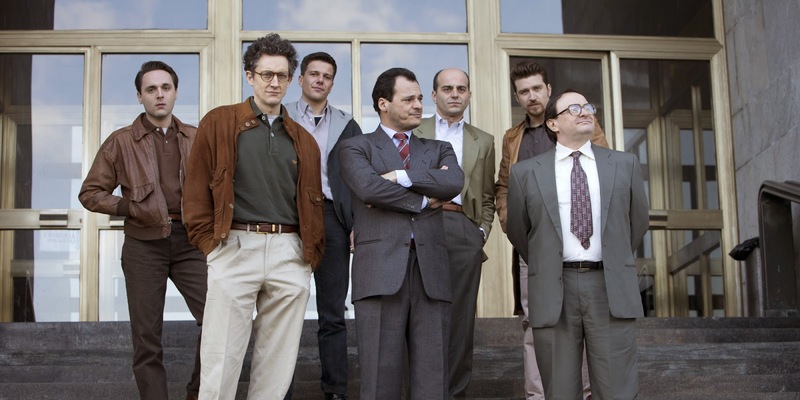 Subtitled drama fans have a new series to enjoy: "1992" (Sky Arts) is a Sky Italia original production, about the battle against political corruption in that particular calendar year. There are several different storylines and it took me a few weeks to work out who everyone was, but I'm getting into it now. It may lack the magic of some of my subtitled favourites but I'm going to stick with it anyway. 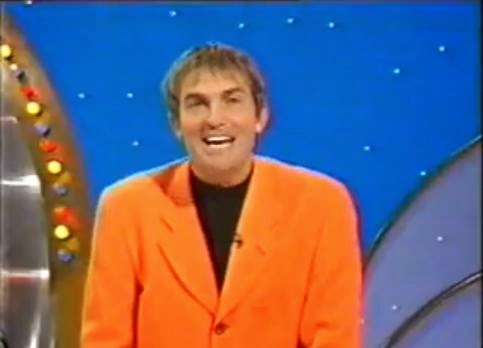 Finally, something more lightweight: we're hooked on the repeats of the Bradley Walsh era of "WHEEL OF FORTUNE" (Challenge) - believe it or not, from 1997! - and if you haven't had your fill by the greatness of Bradley then, the double bill is then followed by the original (pre-Sinnerman) series of "THE CHASE" which is filling the gap nicely as our teatime favourite is currently on a break and "THE PAUL O'GRADY SHOW" is back on ITV for a while. At the end of the day though, despite O'Grady's best efforts, it's a chat show and it therefore follows that it's a plug-fest. If guests have a new TV show, or book, or film etc you can be sure they'll be on this show to plug it!